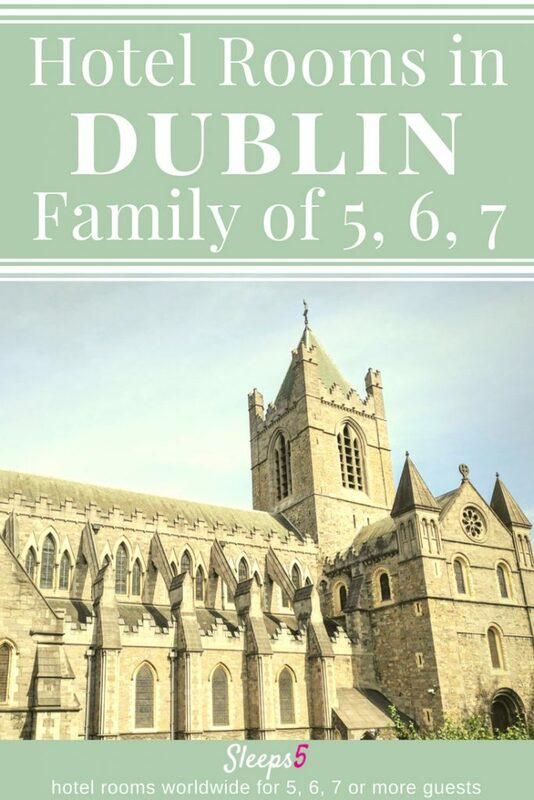 Family hotels: Dublin hotels, B&Bs, and apartment-hotels that can sleep a family of five (5), six (6), or seven (7) in one family room are listed below. The “$” symbol indicates the range in cost per night for each place. Please see the $-symbol key in the sidebar. Click on the hotel, B&B, or apart/hotel name for more details. The detail information includes a location street map, address, phone number, website link, email address, and tips about how to book. Lastly, guests can be assured that all rooms listed have private bathrooms (ensuite) unless otherwise mentioned. The large rooms include various configurations. There are King, Queen, Single, Twin, and extra beds, any some have a pull-out sofa bed to enable a family accommodation. Dublin is fairly expensive for travel, but the list below includes options for a variety of budgets from affordable to upscale. Most are located in Dublin’s city centre, or very nearby. Per Wikipedia, the name “Dublin” comes from the Gaelic words roughly meaning dark pool in reference to a body of water there. Dublin, Ireland has a long and varied history with settlements originating from native Gaelic people to Vikings to early Christians–not particularly in that order. See the Sleeps5 family hotels lists for other cities such as Llandudno, Wales and London. If you find other Dublin hotels for family of 5, 6 or more, let us know! Please email us or comment below with additional family rooms, Dublin family suites, or other large guesthouse rooms.